Steakhouses are trending hard lately in Chicago. Now before you can say "all right, good to know for the next time my uncle's in town, I guess," know that we’re not talking about cavernous, floor-to-ceiling wood paneling, table-side Caesar salad steakhouses. It's the new batch of worldly, decidedly unstuffy steak restaurants looking to crack into the ranks of the classics like Gene & Georgetti and Gibson’s that's making things genuinely interesting. Some of these nouveau concepts stay deeply rooted in old-school sensibilities while others diverge from tradition to create a fresh and different steakhouse experience, but they all have one thing in common: collectively, they're looking to reshape the Chicago dining scene via the very type of restaurant most resistant to reshaping. Chicago has always welcomed and supported steakhouses, but up until a few years ago, opening and operating a steakhouse was undeniably formulaic. To better understand how and why this boom happened, we decided to take a closer look at potential catalysts, talk to the folks behind some of these new steakhouses, and explore the myriad nuances of dining trends. 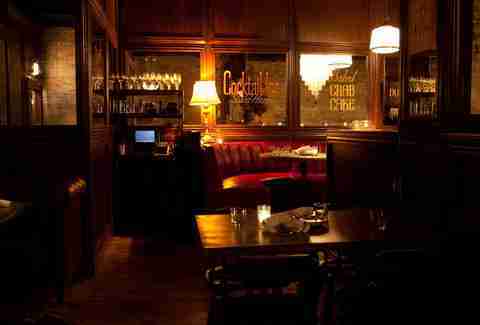 A night out at a classic steakhouse is often limited to one or two neighborhoods adjacent to Mag Mile and involves plenty of pomp and circumstance: salads prepared and served table side, hulking cuts of prime beef, starchy, gut-busting sides, and jazz music lilting in the background. The scene is usually dark, as if to to ease you into the dinner spread, and design elements almost always involve wood, banquette booths, and white tablecloths. Everything revolves around the meat, and appetizers are meant to be consumed by one individual instead of shared. An evening at a new steakhouse, on the other hand, will likely involve trendy music, chic decor, and locales that stretch beyond Downtown Chicago. The cocktails, vegetables, and desserts are prepared with as much thought and care as the steaks, and are often inspired by the cuisines of other countries. Many dishes are designed for sharing, making for a more inclusive and communal overall experience. ... the boutique-y one with reasonable prices in a developing neighborhood. 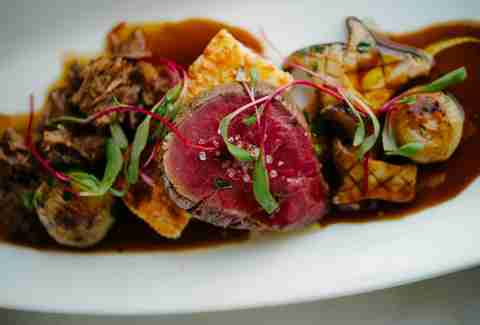 ... French-meets-German with a welcoming, no-frills atmosphere. ... the Argentinean steakhouse backed by an Iron Chef. ... the chic entry from Boka Restaurant Group and B. Hospitality. ... the glamorous spot for seeing and being seen. ... the clubby, DJ-fueled spot with New York roots and a penchant for lighter options. ... the Euro-inspired steakhouse that broke the rules before it was cool to break the steakhouse rules. While most of these new steakhouses have preserved elements of the traditional steakhouse experience, perhaps the most notable is where they're cropping up. It wasn’t all that long ago that dining out at a steakhouse meant confining yourself to the River North and Gold Coast neighborhoods. West Loop, which now lays claim to Swift & Sons, was a natural next step; it’s currently Chicago’s culinary epicenter, and given the neighborhood’s obvious lack of steakhouses, it was only a matter of time before that void was strategically filled. Indeed. Community Tavern is a cozy dining oasis in a neighborhood not yet eroding from a wave of gentrification, and while it’s remained one of the North Side’s best-kept secrets since opening about a year ago, its food is too good -- and steaks too reasonably priced -- to stay a secret for long. Similarly, Boeufhaus is situated on a stretch of Humboldt Park that’s changing rapidly, yet still bears little resemblance to the glossy, high-end blocks of River North. Depending on where you live, it may not be as logistically convenient as a downtown steakhouse, but it’s arguably more accessible given its inviting, neighborhood-y appeal. Rural Society, for example, may be situated Downtown, but it is not the classic, all-American steakhouse. The sweeping meat emporium specializes in traditional Argentine shared plates like morrones (roasted red peppers, whipped eggplant, and anchovies) and braised Wagyu beef belly-stuffed empanadas, house-made sausages, and wood-grilled cuts of beef sourced from South America. Sure, you can still score a dry-aged New York strip here, but that means skirting the experience of a bife de chorizo (ribeye) from Uruguay. Brendan Sodikoff’s Bavette’s pulls more than a little influence from France; here, Caesar salad and meatloaf share the spotlight with Lyonnaise Salad, steak frites, and bone-in filet draped in béarnaise and steak salt. Community Tavern’s menu brandishes some French flair of its own with dishes like a foie gras BLT, escargot, and prime beef tartare. Boeufhaus goes one step further, with its unique fusion of French and German cuisines alluded to in its name leading to combinations like short rib beignets and rye spaetzle. The steakhouse scene bourgeons with more established culturally driven spots, too, like plentiful Brazilian churrascarias and Japanese-leaning Roka Akor, which turns the age-old “steak and potatoes” meal on its head thanks to a robatayaki-style grill that clocks in at over 1,9000 degrees and seals meat juices in while creating a smoky, caramelized char crust. In addition to celebrating global cuisines, this shift away from the classic steakhouse paradigm has led to a more balanced dining experience overall. 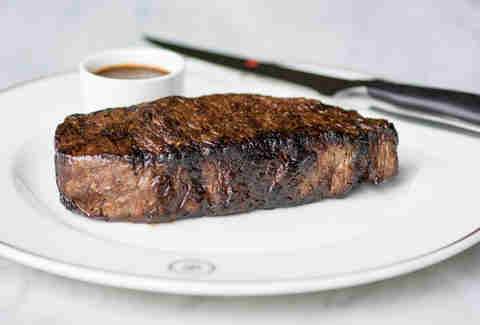 Steak will always remain the pièce de résistance of a meal; however, restaurants are also starting to place greater importance on other aspects of the service, such as thorough beverage programs, more creative and impactful vegetable and fish offerings, and desserts that are far more than an afterthought. No steakhouse better exemplifies this attention to balance and detail than RPM Steak. The beverage program includes an astounding collection of wines, a handful of expertly executed classic cocktails, and a beer list that ranges from the familiar to exceedingly rare deep cuts. Instead of the standard handful of steak options, the menu is made up of 15 different cuts of meat, including a petite bison filet, a 42oz Mishima tomahawk, and just about everything fathomable in between. 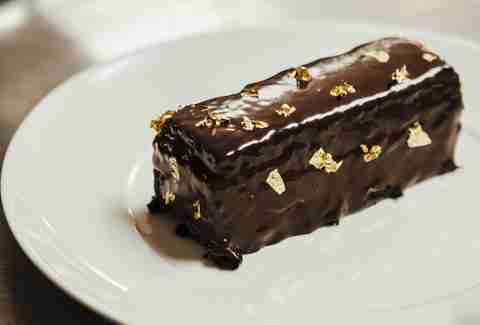 Healthy eating is all well and good, but when it comes to desserts, the new kids on the block are going several steps further than the basic sundaes and overly dense flourless chocolate cakes one could easily associate with first wave steakhouses. RPM Steak’s program includes table-side flaming baked Alaska -- a cheeky nod to the table-side Caesar salad of the past -- and an ultra-decadent gold leaf-flecked chocolate cake. Swift & Sons pastry chef Meg Galus was recently named a James Beard Award semifinalist for her outstanding pastry work, including her whimsical take on a cracker jack with peanut butter mousse, salted caramel, caramel corn, and popcorn sherbet, her made-from-scratch ice creams, and an otherworldly chocolate platter. 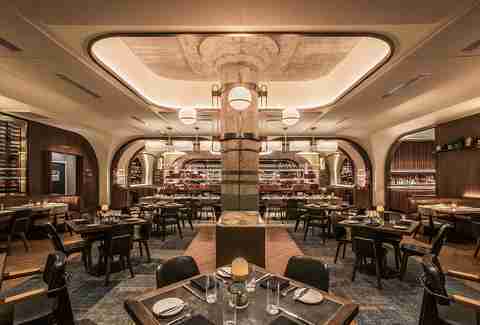 A long time coming, these steakhouses also break from tradition through aesthetic. If you close your eyes and conjure up an image of a steakhouse, what does it look like? If words like “dark,” “supper clubby,” “wood paneled,” “opulent,” and “banquette seating” come to mind, you’ve just envisioned the seemingly ubiquitous design elements found in classic steakhouses. While some of these finishes make an appearance in the design of news spots, they’re relatively few and far between. Boeufhaus and Community Tavern ditch the floor-to-ceiling wood and white tablecloths in favor of exposed brick punctuated with rustic light fixtures and tablecloth-free wooden tables. Maple and Ash and RPM Steak strategically avoid the “cavernous” feel by allowing diffused natural light to spill into their respective dining rooms through windows; RPM Steak’s white seats make the space feel even lighter and airier. 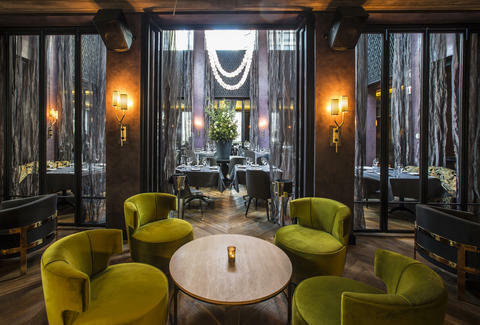 STK, Chicago’s self-proclaimed sexiest steakhouse, flaunts intimate curved booth seating, a marble bar, and textural walls and focal points. And Swift & Sons entertains the eye in all directions with playful tiled flooring, industrial chic metal piping, and a pastoral mural near the bar. It’s true -- Chicago has always welcomed and supported steakhouses, but up until a few years ago, opening and operating a steakhouse was undeniably formulaic. Sure, one place may do béarnaise better than the rest, or another shines with its attentive service, but when it comes down to it, part of the appeal of classic steakhouses is that they’ve built a business off a clear set of diners’ expectations. Perhaps, then, the second-wave steakhouses are a way of repackaging a familiar dining experience in new and inventive ways? Chef-driven concepts dominate Chicago’s greater food scene, and while the talent and ingenuity of these chefs is undeniable, there is something to be said for steakhouses’ collective propensity to value the approachable and comforting aspects of the food above the chef’s ego and influence. Each of these new steakhouses come equipped with great chefs who let their food, however foreign-leaning or familiar, speak louder than their own personal styles. We’d be remiss if we didn’t acknowledge the economical factor of the steakhouse boom, too. After the economic downturn in ’08, the luxury and opulence of the steakhouse experience fell out of favor, both out of necessity to exercise restraint and out of the notion that to indulge at that level wouldn’t be prudent. Now, the country has reached greater economic stability than it has in years, and as a result, people see dining out as a way to treat themselves and become a part of the country’s ever-growing food-obsessed culture. Steakhouses are a vehicle for checking those boxes, simultaneously embodying where Chicago’s dining landscape has been, and where it is going.